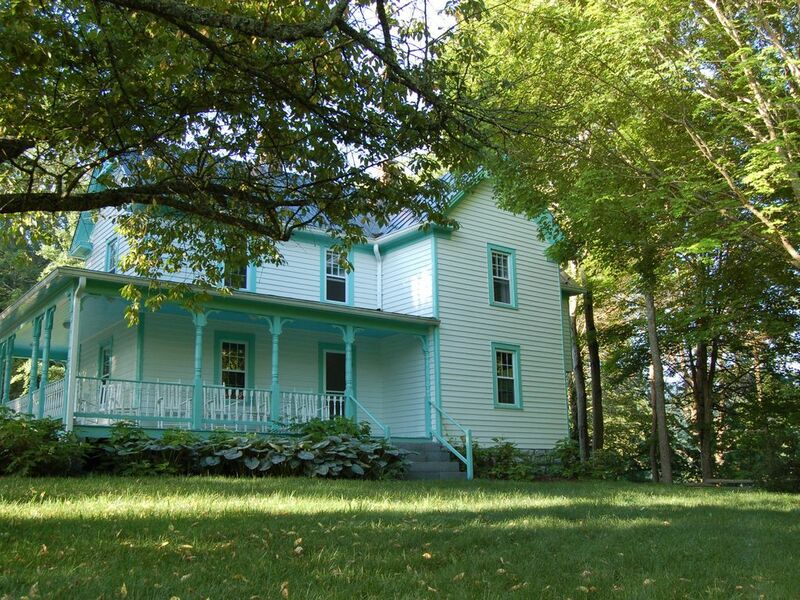 Conveniently located near the crossroads of I-77 and I-81, The Glade is a charming and secluded fully updated turn of the century Victorian farmhouse, located on 62 private park like acres, ideal for a relaxing retreat, or a romantic escape. There are two rental options available, the main house with 4 b.r. and 2.5 baths sleeps 8, and the cottage with a full bath sleeps 2, both have decks with gas grills overlooking spring fed Reed Creek and can be rented separately or together. RATES SHOWN ABOVE ARE FOR THE MAIN HOUSE ONLY, reduced cottage rates apply when both are rented together, cottage will not be rented seperately when farmhouse is rented. Located only 5 miles from interstate and town, with shopping, dining, and all essentials including medical care close by. Close as The Glade is to town, once you cross over our 135' bridge you have escaped the outside world and will immediately feel your pulse slow. Both the cottage and the farmhouse have high-speed wireless internet. Getting There: Located 71 miles from Roanoke Virginia's airport, 75 miles from Bristol Tennessee's airport, and only 120 miles from Charlotte North Carolina's airport The Glade is within reach. From Wytheville exit 70 on Interstate 81, continue right on Highway 52 N / Stoney Fork Road for 2.7 miles to State Road 664 / Glade Road on the left, continue 2.3 miles on Glade Road to the address and sign on the left. Follow the road along the cliff side continuing past brick house on the right to the bridge on the left. Cross the bridge and continue to the right +- 400' to the parking area, which is adequate for 4 vehicles. The private 135 foot bridge is the only access to The Glade as Reed Creek meanders for 1 mile around the property and the steep ridge in the back renders it virtually inaccessible otherwise. You will notice having crossed the bridge you are now on a peninsula created by Reed Creek which makes a hard right turn just past the bridge as it continues it's flow downstream to The New River. The Accommodations : The 1910 restored and updated Victorian Farmhouse and cottage are located on a 7 acre peninsula. It features a large porch on two sides with rockers facing the gardens and the 4 acre manicured lawn on the bottom land where the vegetable, herb garden, and berry patch are located. The grassy lawn is suitable for a variety of sports activities from frisbee golf, and croquet, to touch football. On the creek side of the Farmhouse is a multi level deck with built in benches, a gas grill, with a beautiful long view of Reed Creek all conveniently located off the kitchen an arrangement ideally suited for enjoyable outdoor meals. The cottage which we call the 'Sugar Shack' is located next to the Farmhouse with a queen bed, full bath, it's own private deck, propane grill, mini fridge, and is ideal for a couple. With 4 bedrooms and 2 1/2 bedrooms in the Farmhouse, and a bedroom and full bath in the Cottage. There are 4 queens and 1 king sized beds providing comfortable accommodations for 10. The Glade's sixty two park like acres are varied in terrain, with steep creek side ridges, open meadows, heavily wooded forrest trails, and pastoral grassy paths alongside a wide spring fed creek. Your visit may be relaxing, active, romantic, or a family reunion with multiple generations getting together. You can be assured with absolute certainty your time at The Glade will be a very special memory for all. Suitable for weddings, and other large affairs, The Glade has accommodated up to 200 guests on it's manicured 4 acre lawn. Please inquire regarding any future events. I am a native Floridian 'Flat Lander' who fell in love with this property and decided to purchase even though my wife and I were not ready to live there yet. I am an avowed nature lover and have been able to earn a living as such in the wholesale nursery business for the past 35 years. I am now enjoying the opportunity to beautify and dabble on the magnificent canvas that is The Glade. A previous owner was a landscape architect and began the gardens, we are now enlarging and enhancing them with both ornamentals and edibles in an effort to create more of a permaculture on the property. This area of the country being so different from my native environs I very often find myself in my spare time simply doing a lot of walking with my dog, enjoying the solitude and natural beauty that is found here. In years past, I have spent lots of time in Costa Rica and specifically for the last 20 years on The Osa Penninsula in an area known as Matapalo, where the diversity of plant and animal life is overwhelming. I find the feeling I get at The Glade very similar to that which I feel in Matapalo, a sense of calmness as I am removed from the intrusion of the modern world and am able to easily live in the moment, enjoying simple pleasures we all seem to typically overlook in our day to day lives. I hope all who choose to spend time at The Glade will find the same calmness, I and others have found here. The map below shows the entry to The Glade crossing Reed Creek via our bridge then leading to the farmhouse. The Glade is wrapped by Reed Creek essentially on five different frontages. When I came across this home I was amazed by the property and how it is essentially a peninsula surrounded by Reed Creek accessible only by our bridge. After 5 years of 'sprucing up' the farmhouse, and cottage are perfectly restored and now we are focusing on enhancing the grounds both aesthetically and sustainably with vegetable gardens, berry patches, and fruit trees. I view this property as an Appalachian eco- retreat given the diversity of plant and animal life that we protect and enjoy, and have just recently chosen to share this special place with others. This property is a private park. With the varied terrain and trails one could spend hours hiking and not see all the the beautiful spots it has to offer. The farmhouse with its large front porch and rockers is a great place for a cool drink after exploring, and the back decks offer a great spot to have meals and watch the creek flow by. The two full bathrooms in the farmhouse have beautiful antique claw foot tubs, and the master bath has a great view of the water from It's second floor windows, 4th bathroom is in the cottage which is a separate from Farmhouse. The cottage may be preferable for those unable to go up stairs, as it is all on ground level and is a complete suite with a modern bathroom and large tub / shower along with it's own deck and gas grill and mini-fridge. It is called Reed Creek but I joke that in North Carolina it would be called a river. Essentially surrounds the property. We do have 'beaches' albeit without white sand. Horseshoe Beach is the on the property and a longtime favorite. Both Farmhouse and cottage sit on a small ridge with a lovely view of Reed Creek below. Entire house has central air conditioning as of November 2014. Cottage has A.C. Parking for four vehicles near house with additional parking near by. 62 acres of wide open spaces and trails offering casual to moderately strenuous hiking. Large living room that is separated from rest of the house for quiet chats on large comfortable couch. The Farmhouse has a gas stove and oven. Creek is suitable for canoeing or Kayaking except under low water conditions that occasionally occur. We do not provide equipment. Along with multi level decks overlooking Reed Creek with built in seating, chairs and table, there is also a wrap around porch with rockers that overlooks the gardens and lawn on the opposite side of the Farmhouse. The Glade has an on site property manager, Mr. Bill Mello (B. Mello), who is familiar with all aspects of the properties history, amenities, accommodations, and fishing holes. He has recently been declared 'The nicest man ever by recent guests, and who would argue with three young ladies! Our family spent Thanksgiving at The Glade and we had a wonderful time.The house was the perfect setting for our family celebration. Everyone commented on how comfortable the beds were and there were plenty of bathrooms for everyone. The kitchen was very well equipped and we were able to prepare our meals and enjoy them around the large dinning room table. Jack was super easy to work with and had helpful recommendations. We look forward to our next visit to the Glade. We used this as home base for our Fall motorcycle weekend and it was great. We pretty much use it to have coffee on the porch in the morning, and hang out after dinner in town. It is a beautiful old house, with the sound of the creek all around. Even though we did not cook, the kitchen seemed well equipped. The owner and caretaker were great! I can't begin to find the words to describe the past week.It was one of our most amazing vacations ever!The home is so welcoming.The space is perfect to enjoy all kinds of activities. We had on going art projects, worked puzzles, card games, fishing and more fishing!The kitchen has everything you need.We had campfires every night, hiked..front porch rocking perfect with that morning coffee,evening deer watching or night time star gazing.The beds are comfortable, the bathrooms clean and tubs are great for soaking! This is our second visit and we will be back again and again! Lynn, Thanks for your kind review, and indeed I hope you and yours do return again and again. We had a great time at a fantastic location! The house was clean and well equipped with everything we needed. The setting was lovely. We enjoyed sitting by the creek and walking on th trails. Luckily, we got lots of rain this week and were able to do some extreme tubing! Super fun. The best part was that we were secluded in a peaceful setting so it was just us and our family playing together. This was a great rental location, and we recommend it. We would definitely rent here again. Relaxing family getaway - Loved it! This property was the perfect getaway for us. It is nestled in a beautiful rural setting that made us wish we could stay there even longer. The house was charming and was very clean. Chrissy, the caretaker, was really nice and helpful. We loved the history of the place, and enjoyed exploring on the property, fishing in the creek, playing games in the large yard, and just slowing life down for the week that we were there. It was just what we all needed. Highly recommend! Beautiful serenity at the Glade, highly recommend for any family or group. The creek was the best part of the vacation, tubing around the property was especially nice and the fishing. The caretaker Chrissy was more than a five star! She was so sweet and even with a sprained ankle stayed and talked with us for a while about the history of the original family in the house and their trade. She even mailed my baby's favorite blanket back to us that we forgot! The fireworks downtown were a special treat the night of the fourth of July. The cows were fun to watch across the creek and the property had something for everyone. The house was comfortable and beautiful. The claw foot tub over looking the creek was my favorite spot in the evening. Wonderful location, close to town but felt miles away. Would love to go again. Glad you and your family were able to visit The Glade given the short notice and initial hurdles. Appreciate your kind words and patience. Hope you and your's indeed have the opportunity to visit again. Wytheville is at the crossroads of two major interstates, I-81 and I-77 and is known as 'The Crossroads of The Blue Ridge' located about halfway between Roanoke and Bristol, Virginia. The Glade is within easy driving distance of Jefferson National Forest, the Virginia Birding and Wildlife Trail, New River Trail State Park, Crystal Springs Recreation Area, and other outdoor activities. There are several wineries and vineyards nearby, along with the Wohlfahrt House Dinner Theater and the Log House Restaurant both in Wytheville which offer entertaining and interesting dining alternatives to the norm. However, most guests find themselves spending most at their time here actually on the property itself, as it has been described as a private park with Wi-Fi. The road that is shown crossing the creek on the Google map, is our entrance road and the bridge over to The Glade. There are two rental options on the property, the 1910 Farmhouse with 4 bedrooms and 2.5 baths and the cottage next to the Farmhouse which has a queen bed, a new full bath, deck with propane grill, and mini-fridge. Rates for the cottage are $300. per week, $50. weekday nights, and $60. per weekend nights, cleaning fee of $30. The cottage will not be rented if the farmhouse is rented by others to insure privacy to all. THE RATES DISPLAYED IN THE LISTING IS FOR THE FARMHOUSE ONLY.